1. The act of producing no waste by rethinking, reducing, reusing and recycling resources, imitating natural cycles. 2. An Earth Genius program run by students to reduce waste, saving money and the world! Why? It's EASY and FUN! One Cool Earth: Education for the Future from One With Nature on Vimeo. Empower Youth: Students take on leadership roles and develop pride in a clean campus as they work together in a team. Zero Waste connects campuses to the world at large and fosters civic responsibility. Hands on STEAM: Support Science, Technology, Engineering, Arts, Math with a real-world project that teaches basic skills that students can build on to pursue career pathways. Savings: Individual schools can save $3000 per year in waste hauling! That's money that can go back into classroom resources instead of the dumpster. Environmental Stewardship: Most schools can easily divert up to 75% of waste from the landfill. Our school custodians have noticed cleaner campuses, which means less litter contributing to marine debris and a clean watershed..
18 Schools in San Luis Obispo County are already participating in the Zero Waste Program. Will your school be next? 1. A group of superstar students and adults who lead campus waste sorting and reduction and manage compost. Feel free to use this graphic to support you zero waste efforts. Download​ this image straight to your digital device by right clicking the image! Identify Green Team members. Customize and print these badges for reusable lanyards. Keep it positive! Remember, there will be challenges. Troubleshooting, communicating, and working together as a team is key. Make it fun! Consider adding other Zero Waste events into your campus throughout the year to keep the energy alive such as: an upcycled arts and crafts fair, writing contest, trash talk messages, etc. Create a schedule. An adult supervisor can schedule students on a weekly basis to hold both student and staff accountable. 1. An arrangement of bins used to separate different types of waste for diversion from the landfill. 2. A mechanism for converting flailing kids into responsible and mindful youth. Start with a Waste Audit and a zero waste assembly! 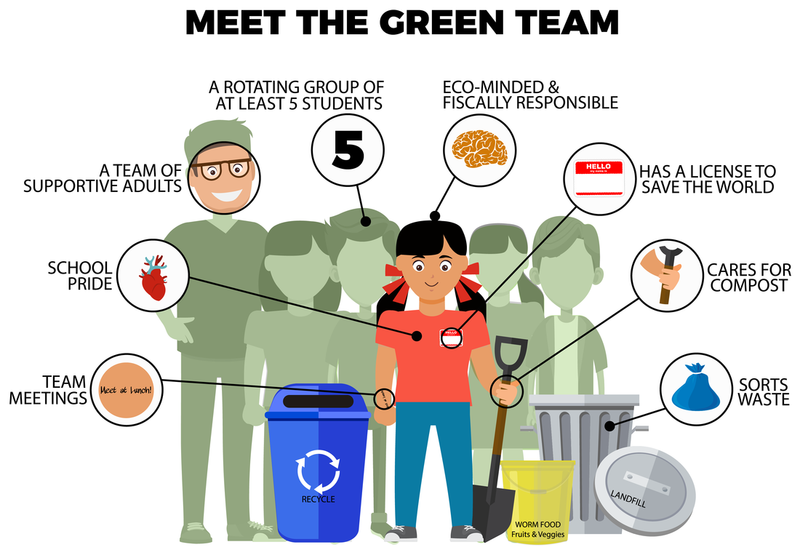 It really gets the whole campus involved and excited to start their green team and waste station. Label waste cans and keep the language and set up consistent for habits to form. 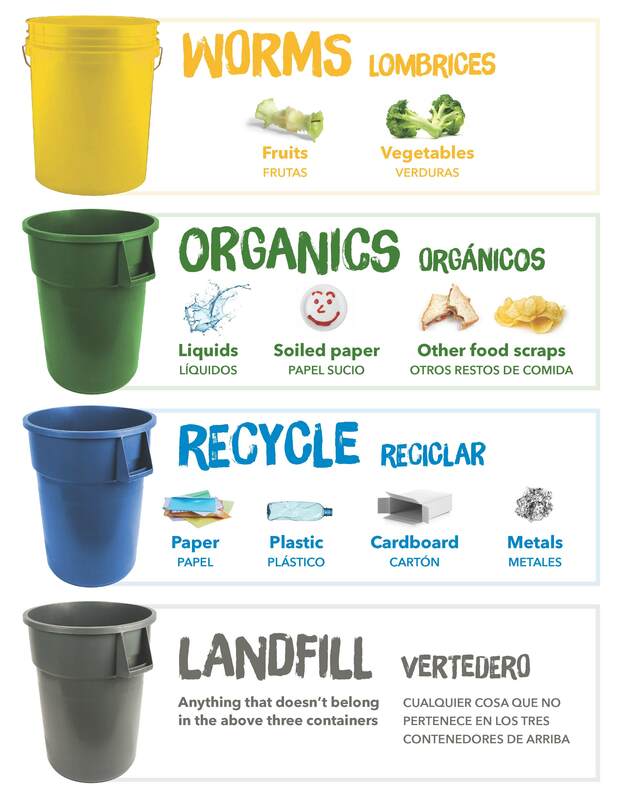 Print and laminate this Waste Sorting Flier and post it on your bins. Make Zero Waste meaningful by integrating Marine Debris Curriculum into your classroom. Actively Reduce Your Waste by following recommendations set forth in this guide. 1. Using worms to break down uneaten fruits and vegetables, converting them to rich soil amendment for your garden to grow nutritious and healthy plants. Contact an agricultural producer (such as a vineyard, fruit, or veggie grower) near you to ask if they can support your school with a donation of slightly damaged 'macrobins'. Contact a sawmill for free sawdust (be sure to use protective glasses when loading) or purchase wood shavings from an agricultural supply store. Got fruit flies? They're not harmful, but be sure to cover your compost since they can be a nuisance. Worms breathe through their skin so if you are getting too many oils from meats, dressings, cheeses, etc. it can clog them up. 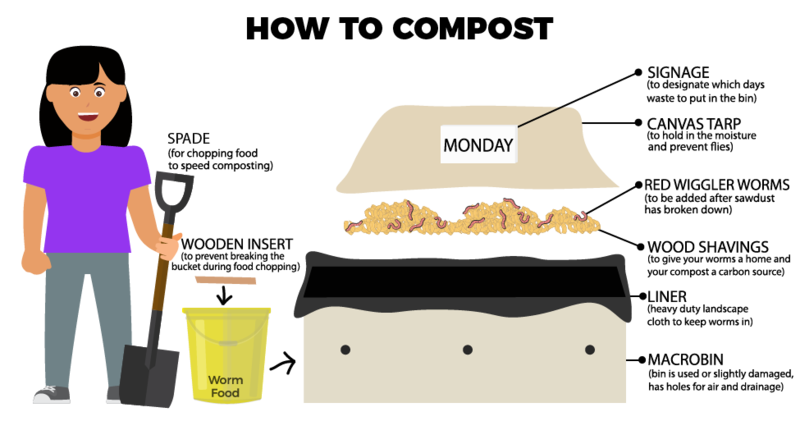 How wet should your compost be? You want it to be like a damp sponge--moist to squeeze, not crumbly and dry. Portable signs on the compost bins allow us to rotate and harvest different bins throughout the school years. The ideal location? A shaded area with water access to clean worm food buckets and wet vermicompost; somewhere easy and quick for students to access during lunch recess. 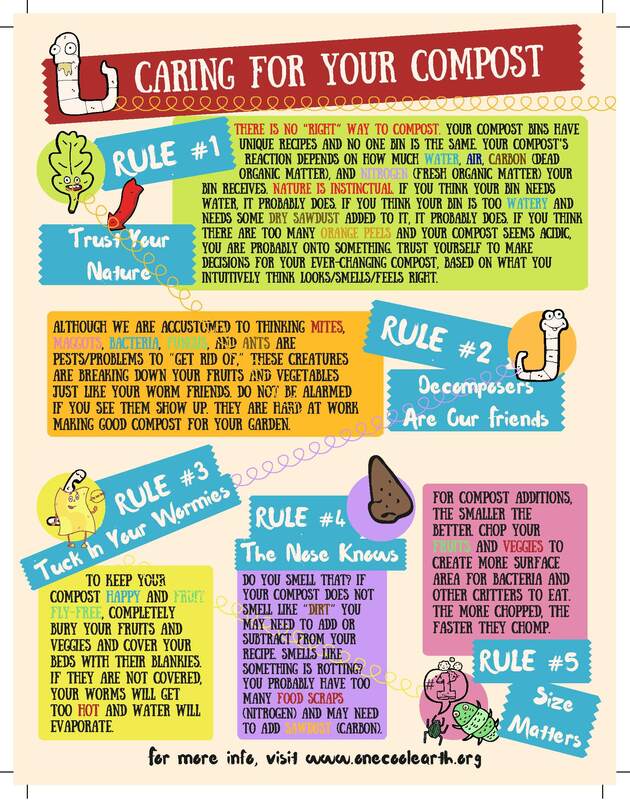 More Tips: Print and laminate this Compost Care Sheet to keep in your classroom or post near your compost.